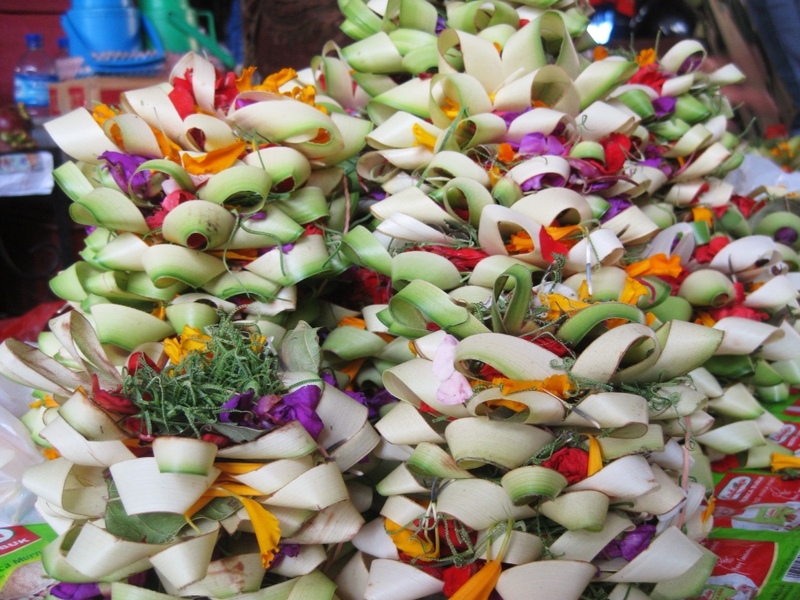 There are two fruits in Bali that I haven’t encountered elsewhere: snake-fruit and mangosteen. The skin of a snake-fruit looks just like its namesake and the white fruit inside has the texture of an apple and the taste of a pineapple. 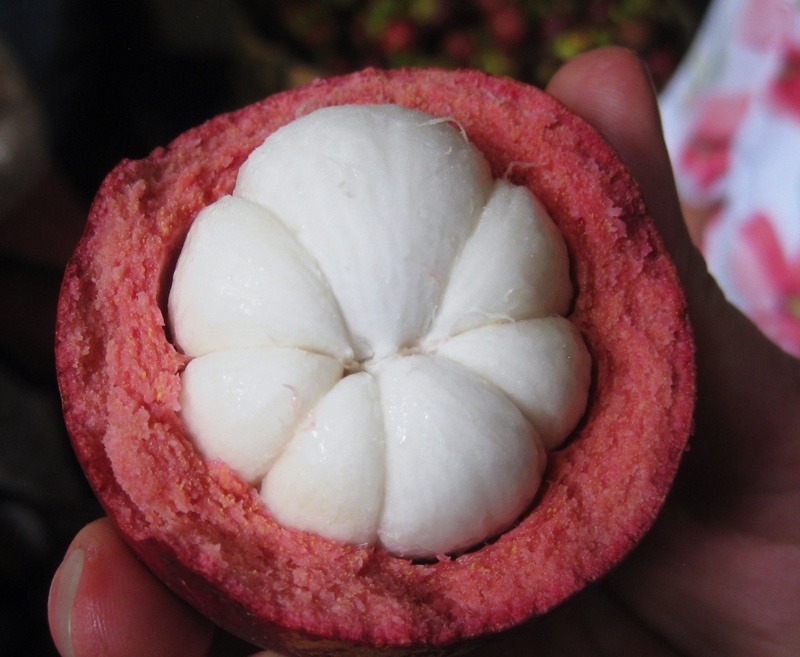 Mangosteen looks like a green pomegranate with a stem and has a small flower on the bottom whose petals tell you how many sections the fruit has. The ivory flesh is sweet and succulent. I had a chance to learn about and taste these fruits, as well as mango, lychee, and passionfruit at the Ubud market, as the start to my day of cooking with Paon Bali. From the market we headed to the rice paddies where we learned about the cropping cycle and how the grain is planted, cultivated, and harvested. 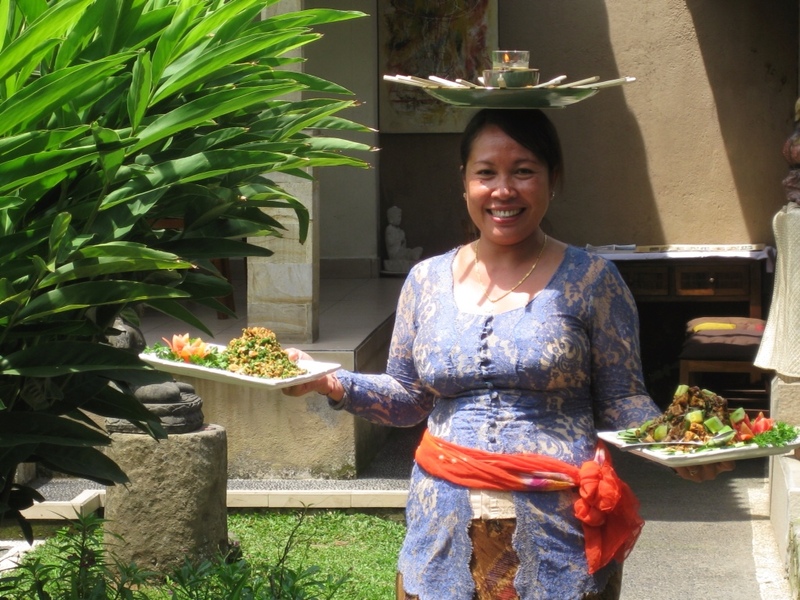 Paon Bali is run by a family in a rural village just outside of Ubud and has the enthusiasm and friendliness of a startup venture initiated from love but intended to support a family. Our host Puspa welcomed us to her home with a huge smile and jokingly referred to the students as “honey bunny” throughout the class. 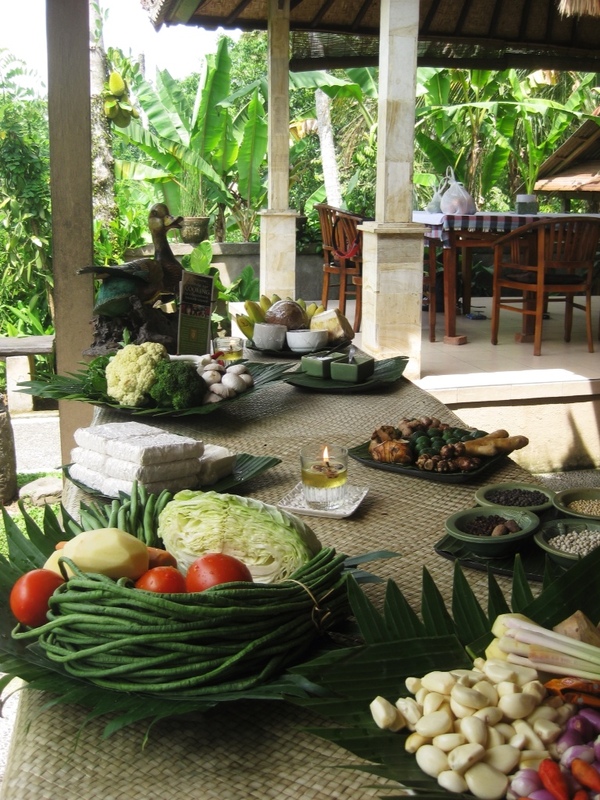 Before we started cooking she took us on a tour of her home and explained the traditional structure of a Balinese family compound, with the kitchen in the south and the family temple in the north, facing Mount Agung. 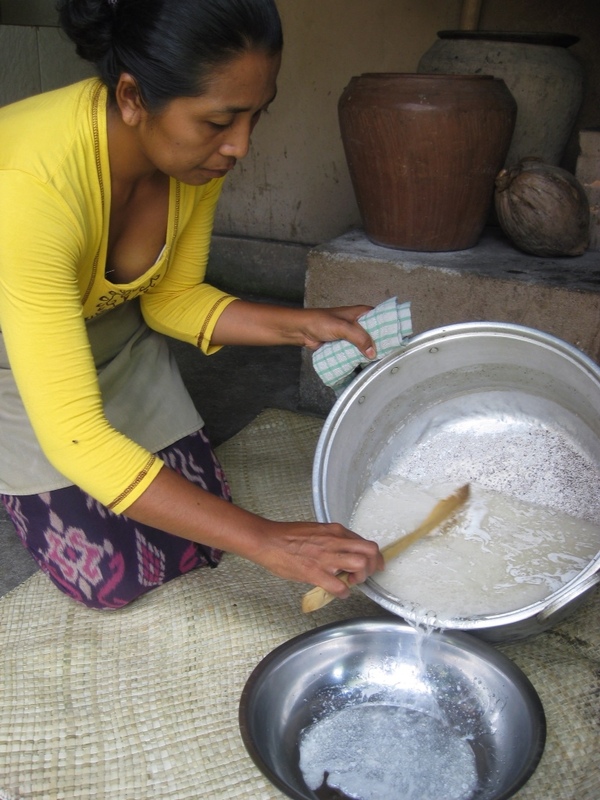 The first thing we learned was how to make coconut oil, the critical ingredient in all Balinese cooking. It is made by grating mature brown coconuts and boiling the flesh with water. Once the oil has separated from the water and milk, it is scooped out and boiled again, then strained for use. Puspa described the process as “easy” but in reality making my own cooking oil is pretty low on my list of do-it-yourself crafts. We began by making Bumbu Kuning, a yellow spice paste that formed the basis of all of our dishes for the day. After chopping up tons of shallots, garlic, ginger, turmeric, chilies, and candlenuts we added spices and mashed everything together in a giant mortar with a four foot tall bamboo cane pole. 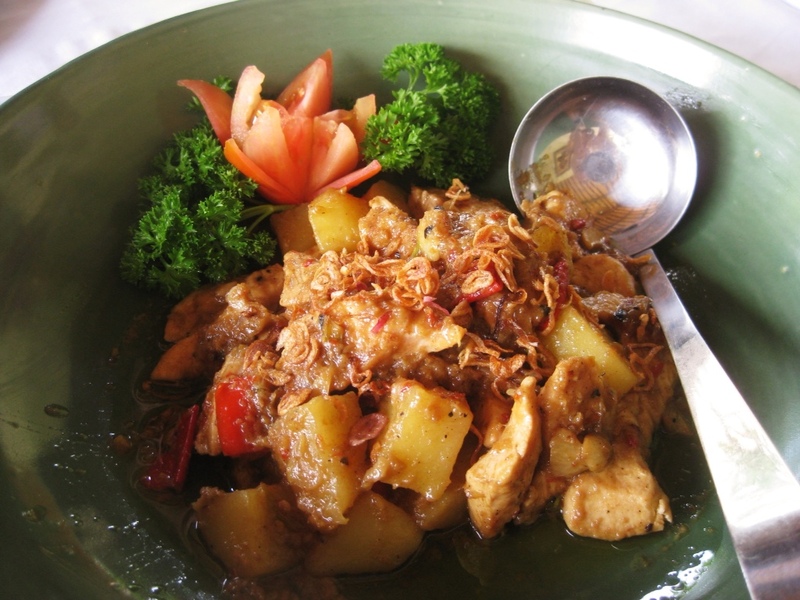 The first dish we used the yellow sauce in was siap mesanten or chicken in coconut curry. We sautéed shallots, garlic, chili, spring onion, Bali lime leaves, and salam leaves (like bay leaves) with the yellow sauce and then added chicken cubes. Once everything was browned we added water until it boiled then added in chunks of boiled potatoes and coconut milk and simmered until all the flavors had combined. The dish was tangy, with subtle coconut undertones and strong yellow sauce flavors. 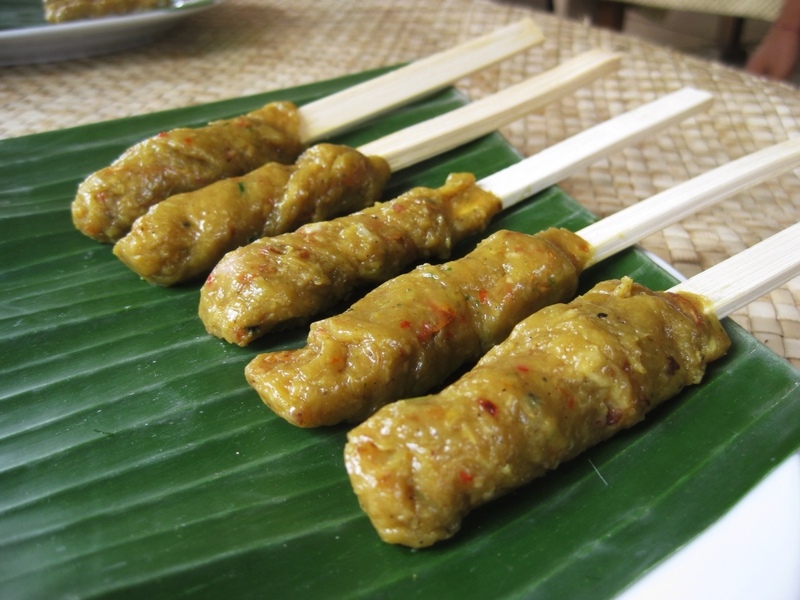 Next was sate siap or Balinese minced chicken satay. 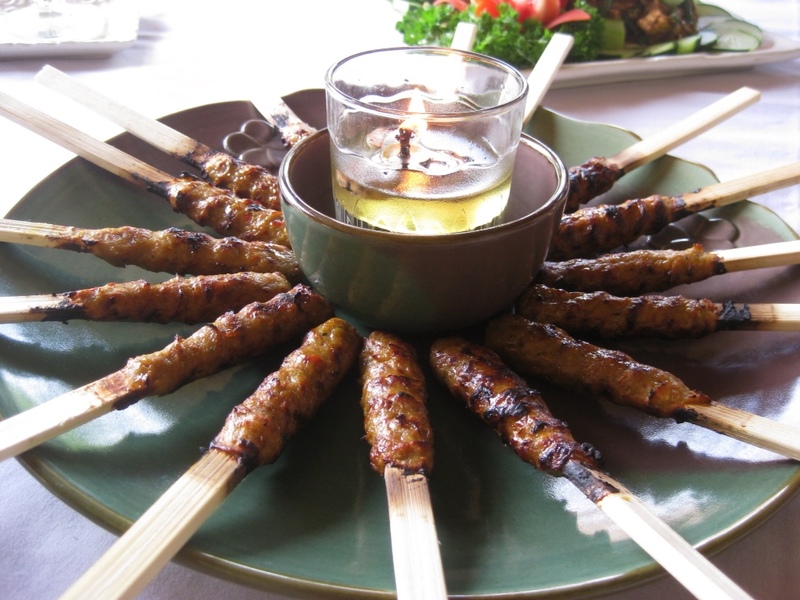 For this dish we combined minced chicken with grated coconut, yellow sauce, palm sugar, and lime and then learned how to secure it around bamboo sticks for grilling. 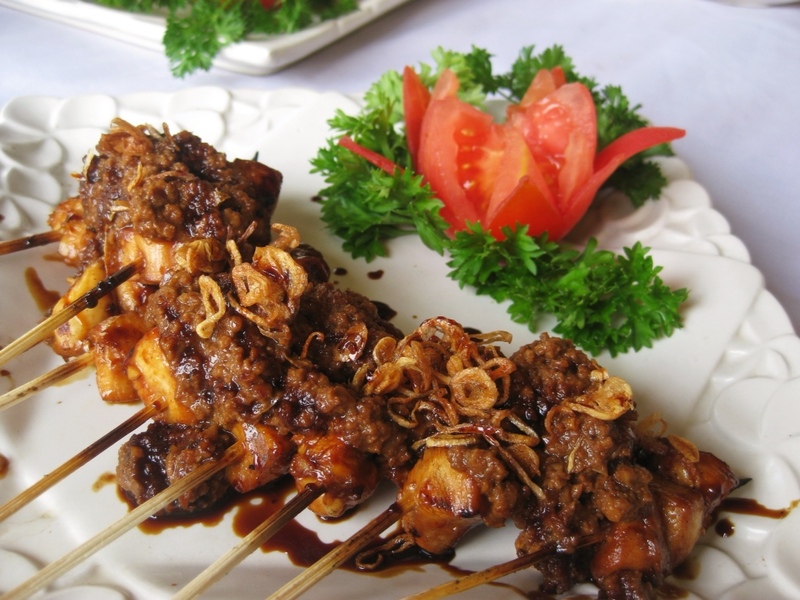 By special request from someone in the class, we also made Indonesian style satay with cubes of chicken so between that and my satay from yesterday, I’m starting to build a basis for comparison. 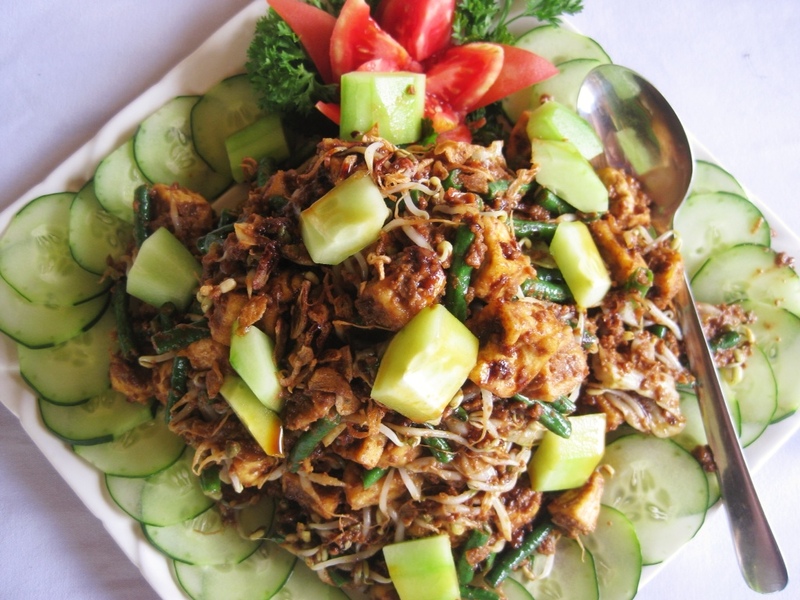 Gado gado is a famous dish that is basically blanched vegetables in a peanut sauce. 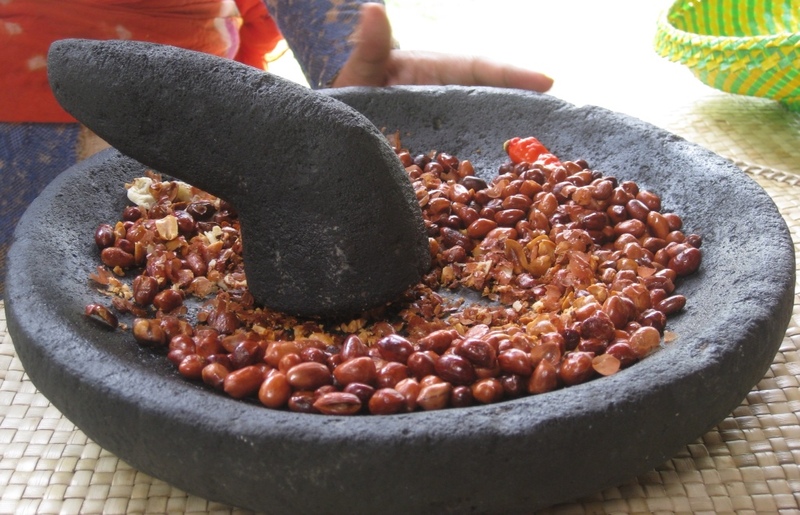 We made the peanut sauce with mortar and pestle and pounded fried peanuts with galangal, candlenut, garlic, chili, tomato and lime. We then cooked it with boiling water and kecap manis, a sweet soya sauce which is a bit like a balsamic reduction but saltier. The dish was rich and had a kick and it was nice to have crisp vegetables. 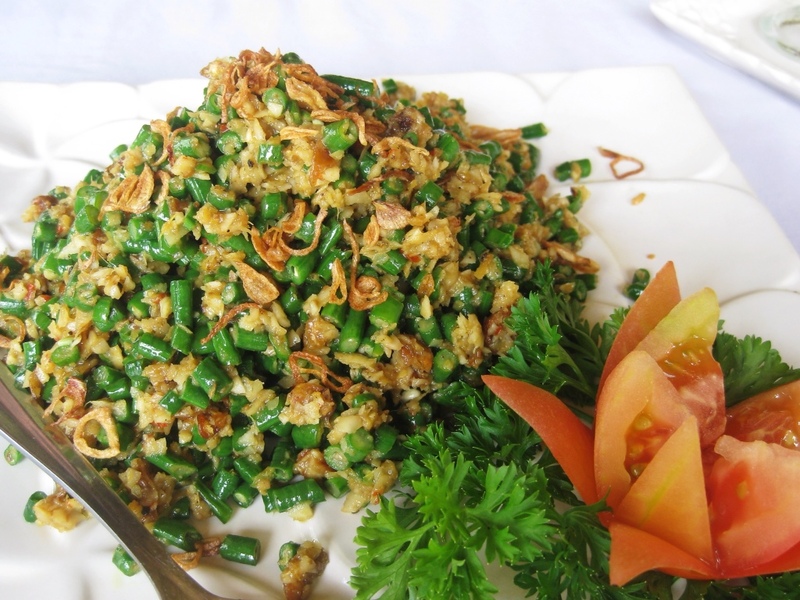 Sticking with vegetables for the moment, we tackled jukut urab a coconut and snake bean salad. Snake beans are essentially long green beans that can grow up to a meter in length but when chopped into millimeter sized pieces as we did, look and taste just like string beans. 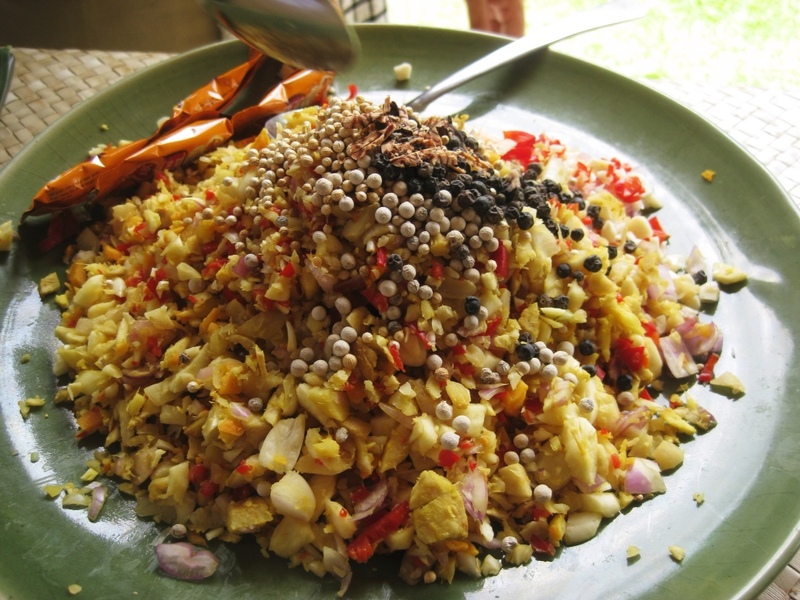 We mixed the blanched beans with freshly grated coconut, yellow sauce, palm sugar, fried shallots, and Bali lime to make the salad. The result was tangy and coconutty and very distinct in flavor – this is not a salad that you could serve as an unobtrusive side dish. 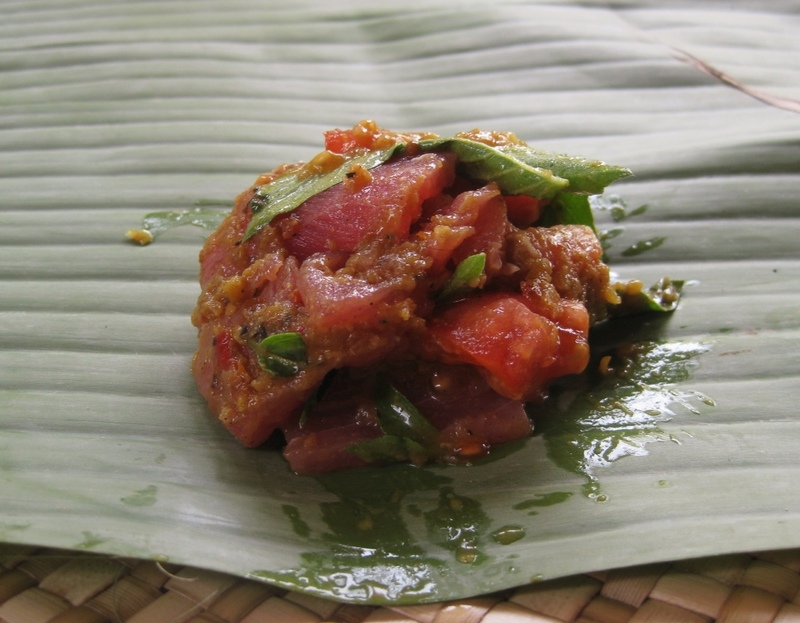 Banana leaf parcels for steaming were up next and we filled ours with tuna slices, tomatoes, lemon basil, and yellow sauce then learned how to fold them up and secure them with toothpicks. The result had a nice flavor but a very dense texture for my taste, particularly compared to the lighter ahi tuna or sushi preparations I would usually have for tuna. 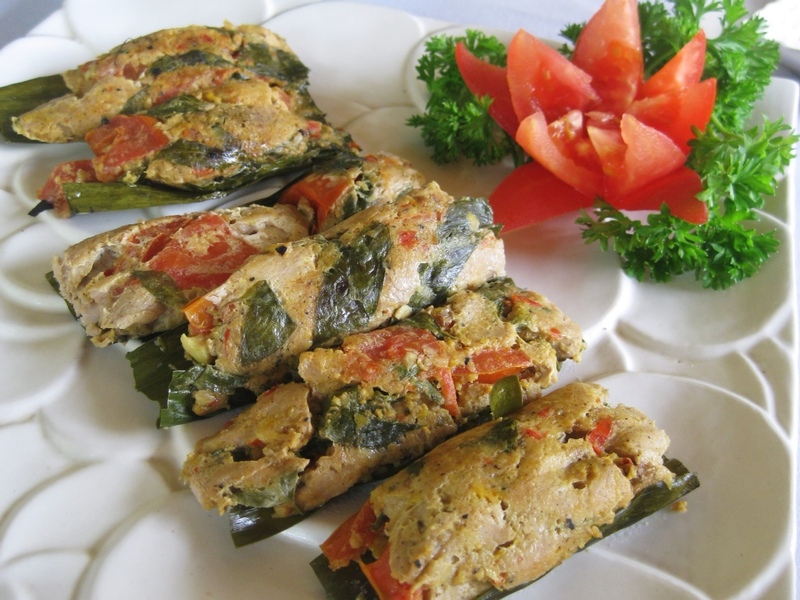 Tempe is a fermented soybean cake and seems to be more popular than than tofu, which is a pressed fresh soybean cake. 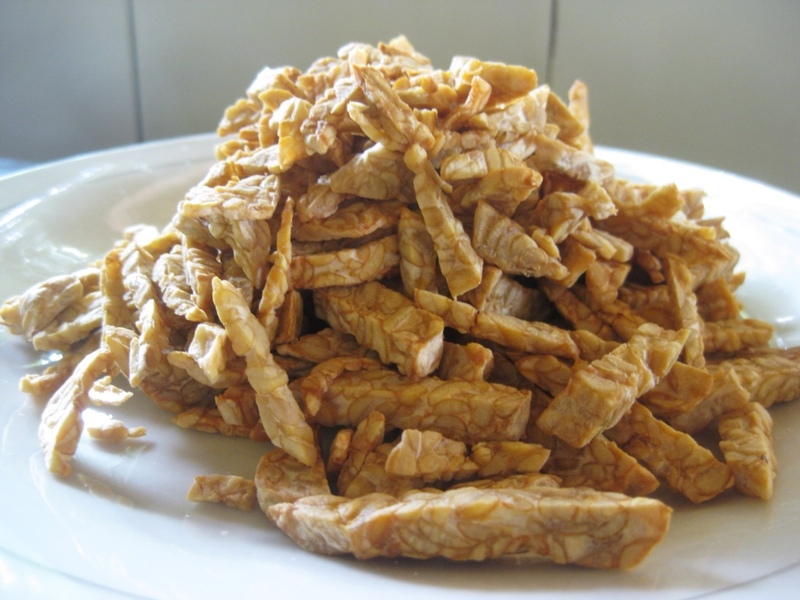 In the tempe here, you can actually see the pieces of soybean mixed in with the soy paste – it looks like an Italian nougat with dense slices of almonds embedded inside. As far as I can tell, the tempe is always fried and then added to a mixture of spices that have been prepared separately. 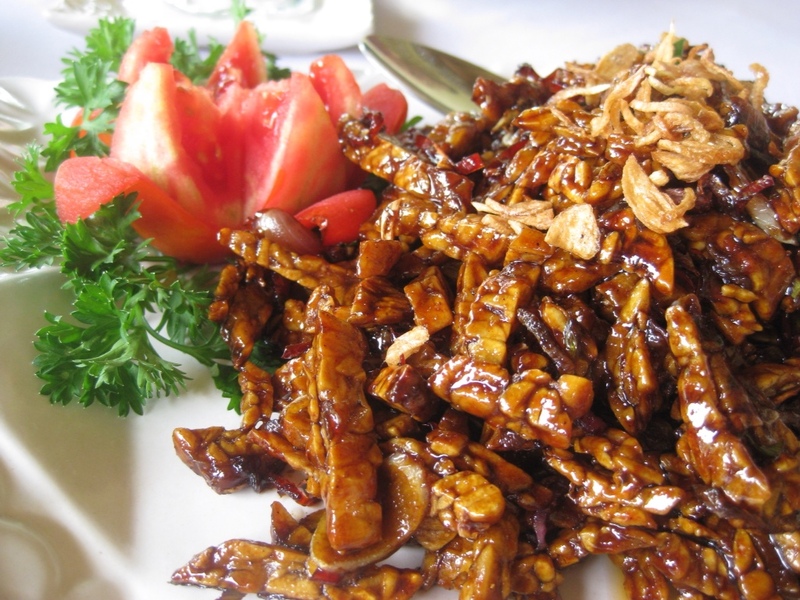 The dish we made was tempe mei goreng or fried tempe in a sweet soy sauce. 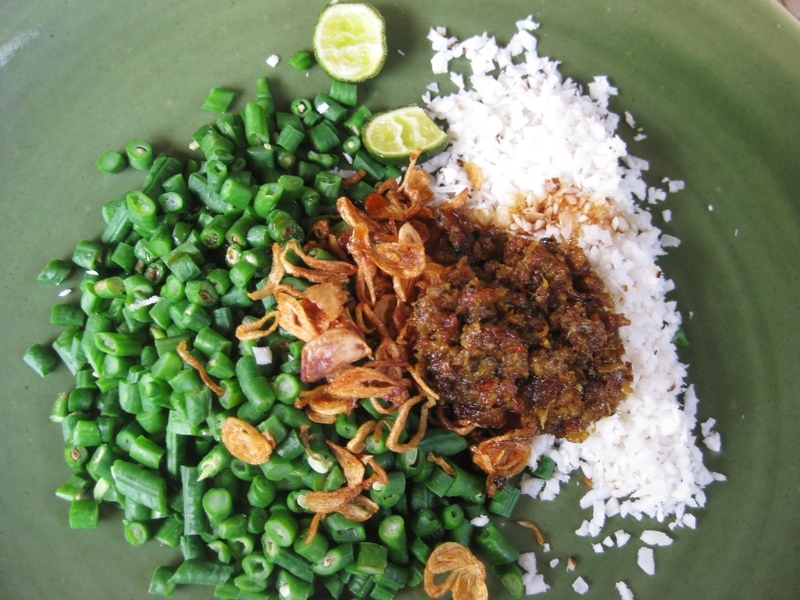 With the kecap manis (the thick sticky sweet soy sauce) we mixed lots of chili, shallots, garlic, spring onion, and Bali lime leaves and then fried everything together to make a dish that balanced sweet, sour, and salty with an undercurrent of coconut oil flavors coming through. 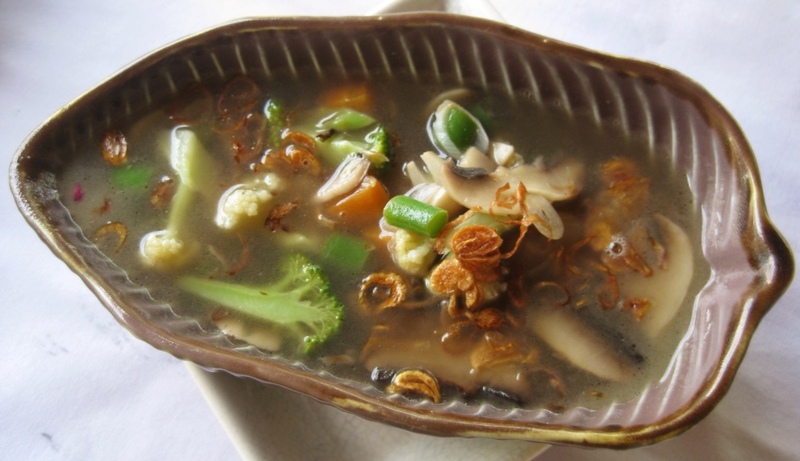 The last thing we made before eating was our appetizer: kuah wong or clear mushroom and vegetable soup. I was a little wary of eating hot soup on a hot day but it was actually very quick to make and quite refreshing with lemongrass and lime creating a pleasantly acidic structure for the mixed vegetables and broth. After we had all eaten our fill of all the main courses, it was time to make dessert – kolak biu or boiled bananas in palm sugar syrup. 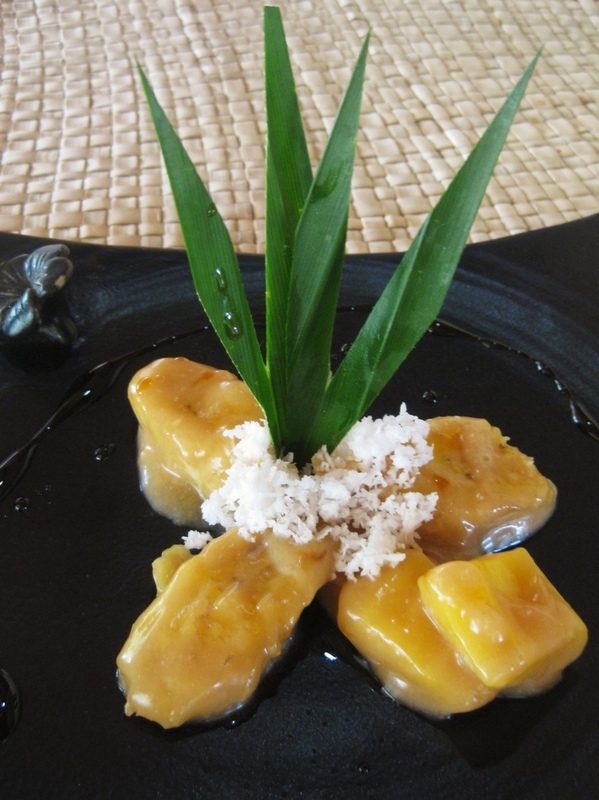 We added sliced bananas, the aromatic pandan leaf, and jackfruit to a pan with a little boiling water and then drizzled in coconut milk and palm sugar syrup. We served the dish with a pinch of freshly grated coconut on top and it was very sweet but had a nice caramel flavor to it. It was a lovely day of learning about Balinese food and culture with friendly and gracious hosts and I left so full that the only responsible thing to do was take a long walk in the rice paddies and then get a twilight massage. 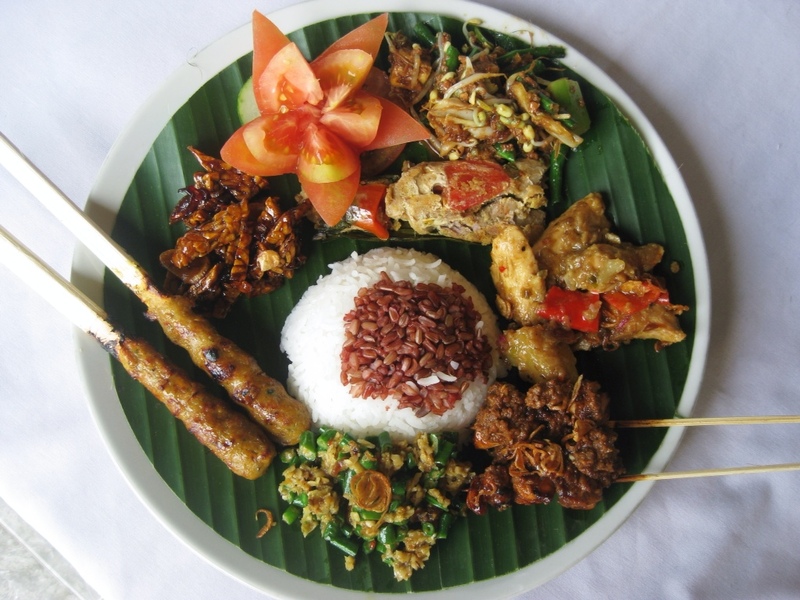 This entry was posted in Bali, Indonesia, Ubud and tagged Bali, Balinese, bananas and palm syrup, Bumbu Kuning, chicken in coconut curry, chicken satay, clear mushroom and vegetable soup, coconut oil, coconut snake bean salad, Gado gado, Indonesia, Indonesian, jukut urab, kolak biu, kuah wong, mangosteen, Paon Bali, sate siap, siap mesanten, snake fruit, tempe, tempe mei goreng, Ubud. Bookmark the permalink.